Introducing the COZYROC SSIS+ library with support for parsing and generating of EDI files. The EDI components are third-party plug-ins for Microsoft SSIS. The toolkit is easy to use and follows the same guidelines and principles used by the standard out-of-the-box SSIS components. Stores the settings for the particular EDI file format (i.e. configuration rules) and the EDI input/output file. Parses EDI files according to the rules defined in an EDI configuration file. Generates EDI files according to the rules defined in an EDI configuration file. EDI Source and EDI Destination make it easy to parse & construct EDI documents via an EDI configuration file. The field mapping and any necessary transformations are configurable via the standard SSIS means. For transferring the EDI files to business partners or VANs, you can use AS2 Send Task or File Transfer Task. The EDI Source Component is an SSIS Data Flow Component for parsing EDI format files via an EDI Configuration File. The component has already been successfully used to process 210, 271, 277, 810, 812, 820, 822, 832, 834, 835, 837, 850, 852, 855 X12 and D95B EDIFACT formats. COZYROC offers consulting services, in case you don't have the resources internally to build the configuration file. For details, contact us. Since the introduction of EDI Connection Manager in the upcoming 1.9 release, EDI Source is now configurable through it. The pre-1.9 parameters are still supported for backwards compatibility and can be configured via the standard Advanced Editor. 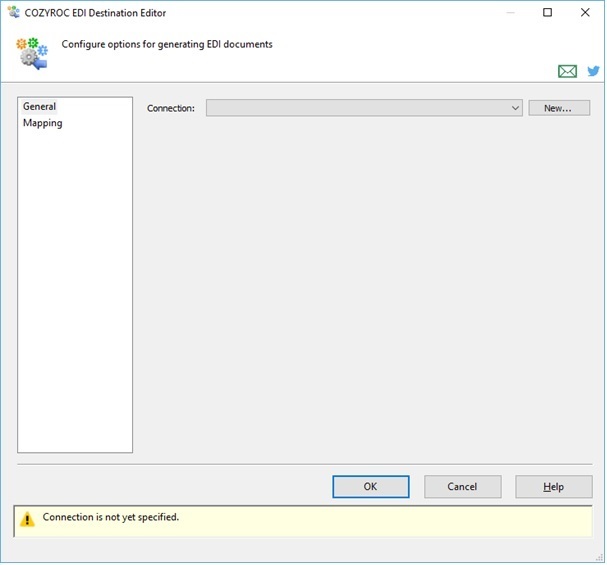 The latest EDI Source has now a custom editor to select the EDI Connection Manager and configure the InsertSequenceTerminator property. In 1.9 use the General page of the EDI Source dialog to configure the component. For older versions of the EDI Source, use the standard Advanced Editor. With the introduction of EDI Connection Manager in 1.9 release, the properties of the older EDI Source are configurable there. Select an existing EDI connection manager. Indicates whether an empty line should be inserted at the end of each repeating segment (related to composite records support). The default is false. Specify the EDI Configuration File. Indicate whether or not the input file name is stored in a variable. This parameter has the options listed in the following table. True The input file name is stored in a variable. Selecting this value displays the dynamic parameter InputFileVariable. False The input file name is specified. Selecting this value displays the dynamic parameter InputFile. Select the input file name. Override the segment delimiter loaded from the configuration file. This parameter is not visible in the setup dialog, but can be set in the data flow task properties pane. Override the field delimiter loaded from the configuration file. This parameter is not visible in the setup dialog, but can be set in the data flow task properties pane. Override the component delimiter loaded from the configuration file. This parameter is not visible in the setup dialog, but can be set in the data flow task properties pane. Override the sub-component delimiter loaded from the configuration file. This parameter is not visible in the setup dialog, but can be set in the data flow task properties pane. Specify the column length for EDI elements. The default is 250. Where can I find the documentation for the EDI Source? I want to use your EDI Source component. Where can I get the XML configuration file for the specific format I want to process? New: A custom editor to replace the basic one. New: All previous configuration properties are now available in the new EDI Connection. This is the recommended way of configuring the component. New: A new parameter InsertSequenceTerminator to support "composite records"-compatible formatting of output data. New: A new configuration parameter escape. The parameter allows specification of escape combination to handle special control symbols like segment delimiters used in the data. New: Component now setups data flow outputs only for looping segments. The previous setup logic will stay the same for existing packages for backwards compatibility. New: Component now provides better diagnostic when column processing fails. New: Component now supports removal of unused outputs and columns. New: A new parameter skipCharacters configuration file. Used for specifying characters, which has to be ignored. This option obsoletes skipNewline parameter. New: A new optional attribute segid for segment element in configuration file. If specified, the component will provide segment identity information. New: A new parameter undefinedFail in configuration file. If set to false, the component will not fail when new fields, components and sub-components appear in the input file. New: A new parameter ColumnLength to specify column length of EDI elements. Fixed: Failed to load configuration files containing special characters like 1D, 1E, etc (Thank you, Bryan). Fixed: Component didn’t provide useful diagnostic information when loading configuration file with errors. New: A new parameter skipNewline in configuration file for avoiding formatting carriage return / line feed characters. New: Component can now match segments by specifying a regular expression in segcode configuration parameter. Also the sub-segments data flow outputs now include the parent segment fields. Fixed: Component did not process sub-segments properly.